Casworon stood at the summit, his booted feet planted on the flagstone, his back, torn crimson cape over tarnished and broken chain mail, pressed against the ancient wall. The battle had been won, but at a terrible cost. The field below was littered with the dead of his foe, Jusveer, King of Zedrov, but so was it with his own dead, except for Arabel. His beloved Queen and wife had been taken during the conflict, by agents of Asluitania who were supposedly neutral. Now that he had won the right to Jusveer’s lands and retained possession of his own, they would likely hold Arabel to random. No, Asluitania would not be interested in ruling these lands, but they would demand a yearly tribute in gold, oil, and spices. Casworon would have to sign a binding decree to pay annually after his Queen’s return. Plus, even if they had mistreated her, he could seek no vengeance against their ruler, Erembour, the sinister Shadowmaster, such was the nature of agreements with evil. The Warrior King gazed out over the vastness of the western ocean, pining for his love as the distant barge, just at the horizon, carried her away to dark lands. There was one chance, but he had to hurry. Once out of sight, the binding magic would not work. Bless Pallando whose arcane wizardry had served them both, as it had his father, and his father’s father. He moved away from the wall and stood firm, though loss of blood caused him to stagger for a moment. His strength came from the cave bear and the direwolf, and had always served him and his people well. Hers was of the eagle, and if the Asluitanians had not drugged her, then the power within her could be manifest. After all, they only kidnapped her after she had been rendered unconscious, and thus was helpless. “My beloved. I know you can hear me.” His voice, always deep and resonant, now seemed to echo within his skull and whisper into the wind. “Alone, we are incomplete. Together we are invincible.” Sorcery such as this had to be used sparingly, for what he was attempting was not a common thing, even in ages past. Yet, if not used now, she could be gone forever. Then, making the pain of his wounds seem as trivial as a child’s skinned knee, roaring agony ripped and slashed through his bowels. His muscles twisted and shivered, then expanded, and his armor threatened to crush his growing frame. He cursed himself for not thinking to remove it first, but now it was too late. Steel links popped like burning embers in a fire, and shot away from his body as the swiftest of arrows. Belt and boots were rent, and his hands became clawed. When he spoke, it was no longer a human voice. It might have been an eternity, but it was likely only minutes when he regained consciousness, still with the form of the beast. In the flesh of his totem, he could have destroyed Jusveer’s forces without an army, but to taste that much blood, he was warned, might result in his permanently remaining a creature. She was coming to him through the air and mist, riding majestically upon the wind, golden wings bearing her in the sky. On the horizon, his eyes still saw the barge and his mind just managed to comprehend its meaning. Then she was at the low wall, bloody and gore covered talons gripping the stone. The beast growled because that was all he could utter, but his bestial heart burned with love and gratitude. The change happened for both of them. The eagle cried out as the pain returned, feathers were shed by the score and sacrified to the ocean blow. The beast lost his fur, his claws and fangs were clipped, and then they were both renewed as man and woman again. “My husband.” She caressed his bearded cheek as they laid together on cold, bare stone, exhausted. Together, wrapped in the last of his battle raiment, Casworon and Arabel descended back down to the field of the dead, and asking forgiveness of their spirits, supplied themselves with what they needed from their departed comrades. Then together, they began the long walk toward the lands of their allies, and home. 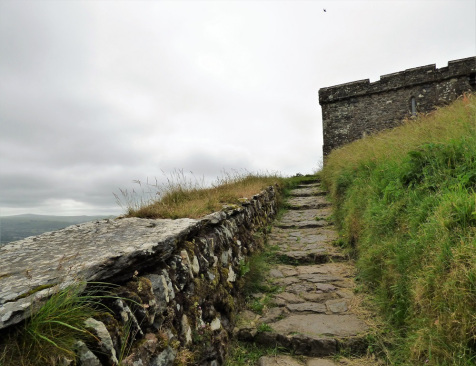 I wrote this for the Thursday photo prompt: Summit #writephoto hosted at Sue Vincent’s Daily Echo. Every Thursday, Sue posts one of her original photos as a prompt to be used to craft a poem, short story, or some other creative work. I’ve been thinking about heroes, masculinity, and chivalry this morning and used the photo as the catalyst to write a tale of swords and sorcery. It was fun. I hope you liked it. Oh, Casworon is an old Cornish name meaning battle hero, and Arabel means the one who prays and is an Eagle heroine. I took those names, and all of the others, from the Mom Junction website. Wasn’t surprised that you went the sword and sorcery route 😉 Well done, written almost like myth or fable. That was exactly my intent, Trent. Thanks. Interesting, you raised my warrior prince and made him a warrior king! Definitely the prompt has that feel to it. Thanks for the reblog, Stuart. Beautifully written and visually stunning, well done for creating so much in so few words! Thank you and thanks for the reblog. Thanks, Sue. Google is good (except when it’s bad).